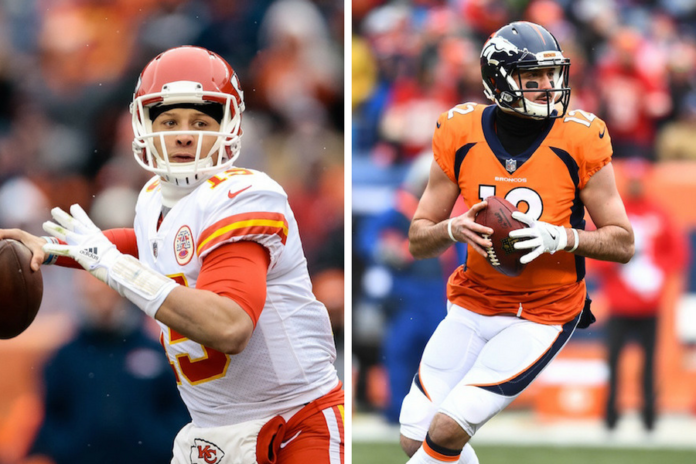 If the future of the AFC West was on display at Sports Authority Field at Mile High on Sunday in Week 17, that future looks like it could be quite entertaining. 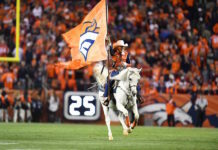 At halftime in a battle of the two teams that own the last eight AFC West division titles, rookie Patrick Mahomes and the Kansas City Chiefs led the Denver Broncos and second-year quarterback Paxton Lynch 14-10 in a back-and-forth affair that saw plenty of big plays from both sides. Kansas City wasted no time in getting their offense going under Mahomes. The NFL’s leading rusher, rookie Kareem Hunt, broke a 35-yard run for a touchdown to cap an 86-yard drive that lasted just 57 seconds. The longest play of the drive was a 51-yard pass to Demetrius Harris from Mahomes, making his first NFL start with Alex Smith on the bench to rest ahead of the playoffs. Making his fourth NFL start, Lynch and the Denver offense went three-and-out on their first possession, but the Denver defense quickly turned the tide against Mahomes. After Kansas City picked up 18 yards thanks to a short pass and a facemask call against Denver to open the next drive, Darian Stewart picked off Mahomes deep in Denver territory to give the Broncos the ball back. 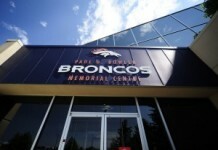 Stewart’s nine-yard return was pushed back 10, however, due to an illegal block by fellow Broncos safety Will Parks. Lynch picked up a quick first down on a 10-yard pass to Demaryius Thomas, and then hit Jordan Taylor for a gain of nine on the next play. The combined running efforts of Devontae Booker, who had a nice 14-yard pickup, and C.J. Anderson helped pick up a couple more. Lynch connected with Thomas again on a 19-yard slant to help Thomas in his pursuit of 1,000 yards. The veteran entered the game needing 108 to keep his streak of 1,000-yard seasons (five and counting) alive. Lynch and Taylor connected again on third-and-nine inside the red zone, but only for five yards, thus ending the promising drive. Denver would settle for a 36-yard field goal from Brandon McManus to bring the score to 7-3 with 5:26 remaining in the first quarter. Kansas City nearly turned the ball over again on the first play of their next drive when backup center Jordan Devey snapped the ball over Mahomes’ head to open the drive. Denver kept up the pressure with a sack of Mahomes on third-and-18 by Shelby Harris. A delay of game penalty on the punt backed up Dustin Colquitt another five yards and Taylor was able to fair catch the punt at the Denver 45-yard line. C.J. 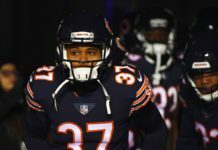 Anderson who was also in pursuit of a 1,000-yard season — on the ground — had a bit of a scare on the next drive when he left the field with an injury. He returned to the game later. The drive fizzled after just 14 yards, but Denver was able to pin Mahomes deep when Marcus Rios tackled De’Anthony Thomas at the Kansas City six-yard line. Thomas was hurt on the play and carted off the field. Denver nearly had Mahomes sacked on third-and-14 on the ensuing drive, but Parks was unable to wrap up the quarterback on a safety blitz. Mahomes escaped the pressure and hit Albert Wilson for a 17-yard gain and a first down to extend the drive. Akeem Hunt nearly nabbed another third-down conversion on a checkdown from Mahomes, but Brandon Marshall forced the running back out of bounds just shy of the line of gain to force another punt. Denver’s next possession showed what the Broncos hope they have for the future on offense. Lynch broke three tackles en route to a first down at midfield after a pass of 14 yards to Bennie Fowler. Lynch hit Thomas again for another 10 yards and Taylor for five, setting up the big play of the drive. Rookie running back De’Angelo Henderson took a screen pass from Lynch 29 yards to the end zone, breaking several tackles in the process, for his first NFL touchdown. A successful PAT gave Denver a 10-7 lead. Mahomes responded with a 19-yard pass to Wilson to open the drive. The duo picked up another 24 later in the drive to get into the red zone. They connected again for nine on the very next play as the clock wound down to the 2:00 warning. After a first-down run by Anthony Sherman to set up goal-to-go, Mahomes nearly had his first NFL rushing touchdown as he scrambled and dove for the far pylon. The rookie’s foot stepped out of bounds with the ball at the one-and-a-half-yard line, however, and he would have to wait. Sherman, the fullback, reaped the rewards of the drive with a touchdown run on second down to reclaim the lead, 14-10. The Denver offense took over at their own 29-yard line after a return by Henderson after the score. With 1:01 on the clock and all three timeouts available, Lynch went to a reliable target in Demaryius Thomas for an 11-yard gain. He then dropped a pretty over-the-shoulder pass to Taylor on the next play for a gain of 30. Lynch made his only big mistake of the half, however, on the very next play by throwing late into heavy coverage deep across the middle. Terrance Smith grabbed the deflected pass and took it six yards the other direction. Kansas City tried to kneel on the ball to end the half, but with timeouts remaining Broncos head coach Vance Joseph forced the Chiefs to punt. A 77-yard effort by Dustin Colquitt over the heads of Taylor and Isaiah McKenzie brought an end to the half. Mahomes ended the half 8-of-15 passing for 135 yards with an interception and nine yards rushing. Lynch was 13-for-18 for 159 yards, a touchdown and an interception. Lynch had eight yards rushing on two attempts in the half.